In the same week that the biggest newspaper in the world, the New York Times, lent its editorial pages for a blistering attack on the Brazilian democracy urging them to let jailed Presidential Candidate Lula from the Workers Party run and bypass its judiciary system (see our related coverage), today it published an editorial painting a very bleak picture of the leading candidate, Mr. Jair Bolsonaro. Mr. Bolsonaro, who is the hope of a younger generation in Brazil, is slammed as a candidate by a newspaper that promises always to be ‘free and fair’. Related coverage: <a href="https://thegoldwater.com/news/34748-New-York-Times-Editorial-Illegally-Promotes-Brazil-Election-Meddling">New York Times Editorial Illegally Promotes Brazil Election Meddling</a>. 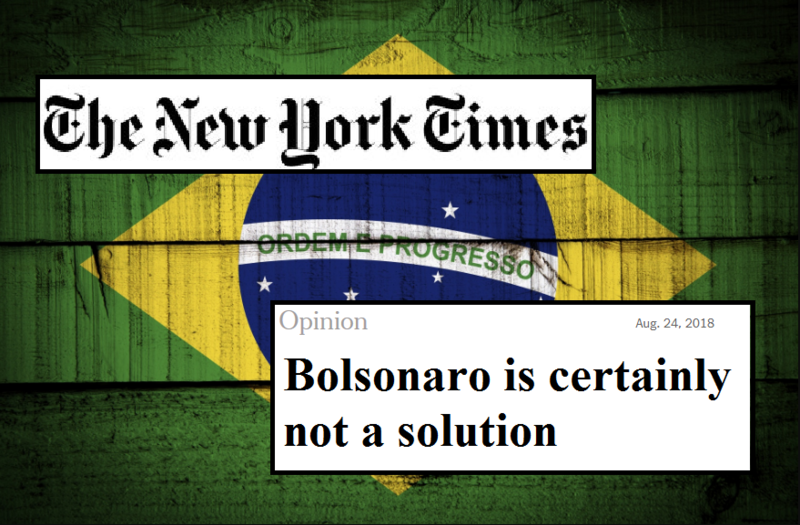 If we didn’t know any better, we would accuse the New York Times of trying to meddle in Brazil’s election, but that would be illegal wouldn’t it? Is criticizing a candidate meddling in an election? If you do it repeatedly and try to steer them away from a certain party, I would say so yes. Certainly if you lend your opinion pages to leftwing analysts while the right leads the polls it becomes a bit suspicious.